Move over, Google Maps. Yes, you got me through my Croatian road trip, but another app has stolen my heart. 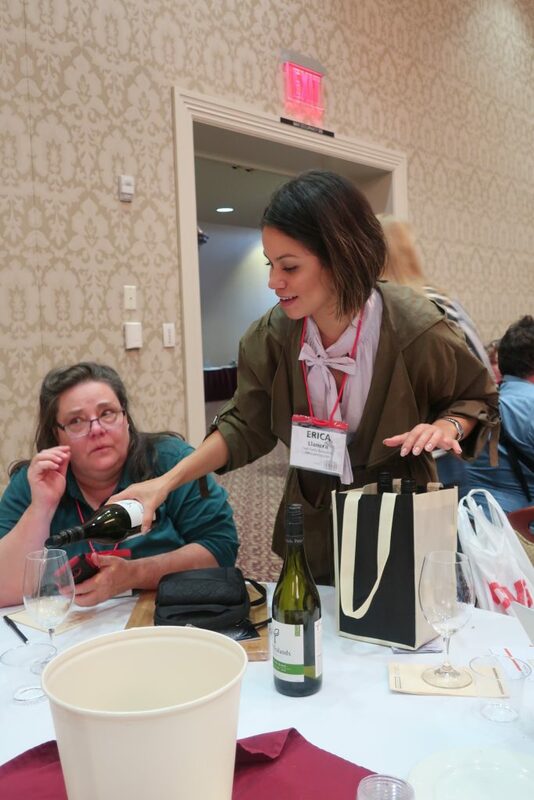 I discovered Wine Game when I checked into this year’s Wine Bloggers Conference. 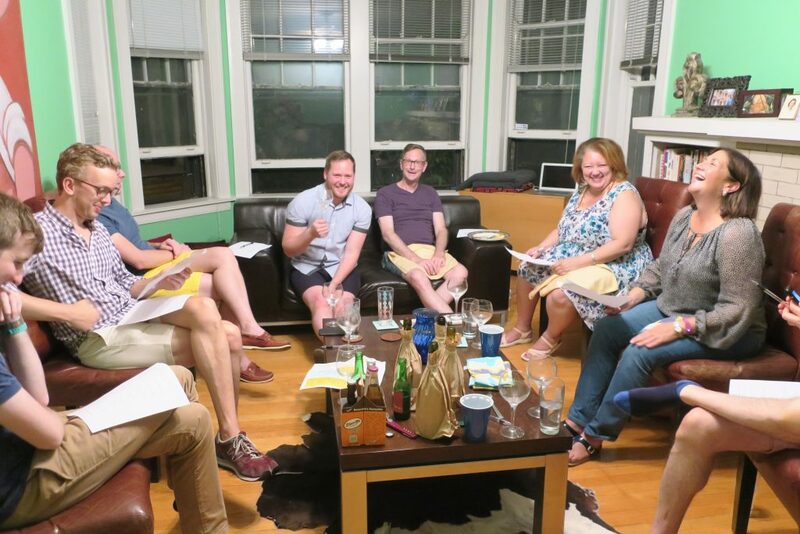 My cursory glance at the promotional materials on the sign-in table turned to keen interest when I saw the words “blind tasting” and “game.” Blind tasting is one of my favorite challenges, so much so that my friend Liz and I started a web series about it. 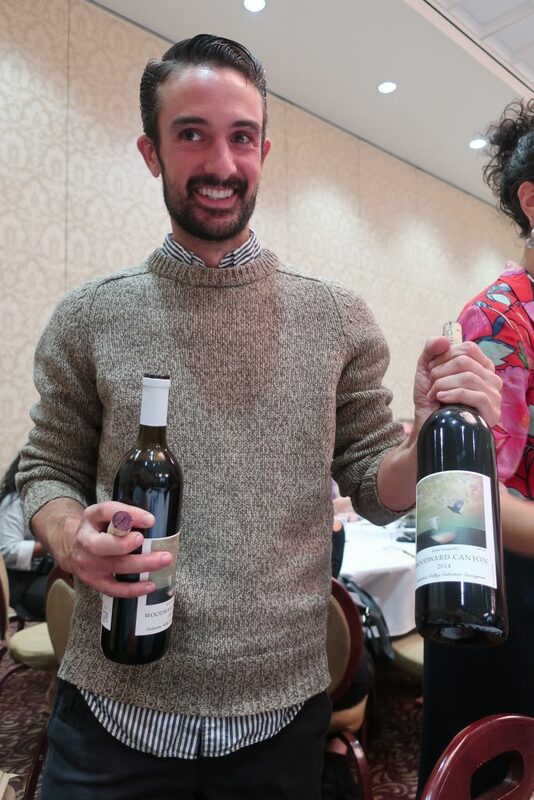 Fortunately, Wine Game investor Dorian Patchin was also attending the conference. We took time to film a quick round of Wine Game with him, in order to learn about the app and show off our blind-tasting talents (I’m afraid I accomplished the former goal more so than the latter.) He selected two bottles for us to try, and my goodness, he did seem to enjoy it when we struggled. But in spite of the struggles, or perhaps because of them, we had a sensational time playing Wine Game. 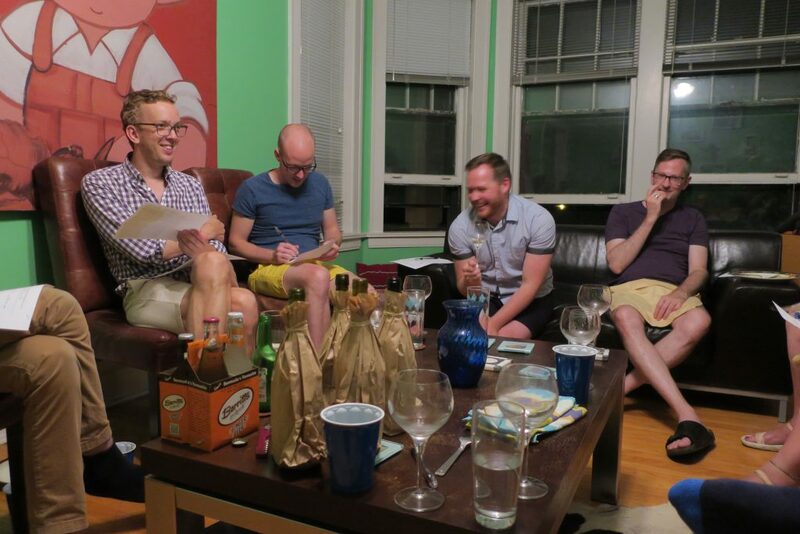 The app is free, so it’s a great way to organize a blind-tasting party with your friends. Who doesn’t love a good drinking game? And for you Luddites without smart phones, you can use a web-based version as well. Here’s how it works! If you liked this Name That Wine video, be sure to subscribe to our YouTube channel! Subscribers are clearly superior human beings. Having fun at Speed Blogging. Complaints about Speed Blogging seem to be more common than usual this year, though it’s always been a bit of a controversial event at the Wine Bloggers Conference. Speed Blogging is, simply put, controlled chaos. The organizers like to call it “Speed dating for wine,” which is a fairly apt description, except that each winery has a five-minute date with a table of 10 bloggers, not just one. When that five minutes is up, they move on to the next table, and we bloggers receive our next “date,” ready or not. People complain that this format doesn’t do justice to the wines, that it’s impossible to taste and listen and take notes and take photographs in the allotted time, and basically that this isn’t they way they usually taste wine. Fiddlesticks. Unless you’re in a seminar setting, most wine tastings are louder and more chaotic than people — even wine professionals — seem to realize. A walk-around tasting, the most common wine-tasting format, tends to be crowded and noisy. Tasters jostle to get to the most popular tables, pourers are trying to talk about the wines — often several at once — and everyone is sharing tasting notes and impressions with each other. Even a very hotsy-totsy “Silent Tasting” I once attended in Bordeaux was surprisingly loud. It’s far more common to be surrounded by distractions while wine tasting than not, unless you prefer to drink at home alone, of course. Speed Blogging has helped me to focus on a wine and form an impression of it quickly, in spite of what’s happening around me. It’s an important skill that’s served me well over the years. And so, to the white wines. Whites aren’t nearly as popular to produce in Washington as reds, but the ones they do make tend to be quite good. There was only one wine I really didn’t care for in this round of Speed Tasting, and it came from elsewhere. 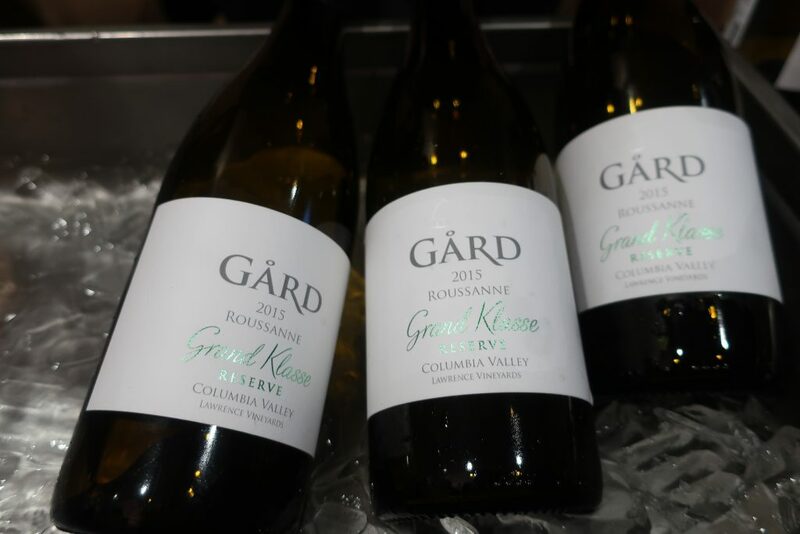 2015 Gård Vintners Roussanne: Washington winemaker Aryn Morell told us that this Rhône variety tends to be “oily and full, and there’s no reason to hide that.” And he does not. This Roussanne has heft! I love it. Pear/apple fruit, balanced oak and cream, lightening into acids, white-pepper spice and a touch of eucalyptus freshness… It’s right up my alley. This Norwegian-owned winery made its first vintage just 12 years ago in 2006, but they know what they’re doing. A great deal for $24. 2017 Otis Kenyon Wine Roussanne: Like the Gård, this Roussanne comes from the Lawrence Vineyards, but it’s a very different wine. It has a more savory aroma, rather than fresh and heady. “Our Roussanne is definitely meant to be crisp,” owner Muriel Kenyon explained. It had cool and clean pink-lady apple fruit, and focused acids that, interestingly, had a darker feel than the Gård’s. Excellent balance. This is your summer Roussanne, and the Gård is your winter Roussanne. Another very fine buy at $23. Consternation is the most common Speed Blogging facial expression. 2016 L’Ecole No. 41 Semillon Columbia Valley: Winemaker Marty Clubb was in the middle of his 36th harvest when he poured this Semillon for us. Talk about dividing your focus! I’m very glad he took time out to present his wine, a Bordeaux-style blend of 76% Semillon and 14% Sauvignon Blanc. It had an unexpected and enjoyable note of rosemary in the aroma, and lightly honeyed fruit followed by white-pepper spice and a dry finish. It was clear how this sort of wine can become Sauternes. Clubb told is that “Semillon is the most underappreciated white grape on the planet,” and I’m inclined to agree (though Furmint is also up there). This is an absolute steal for $15. 2018 Peter Yealands Sauvignon Blanc: One sniff gave this wine away as a New Zealand Sauvignon Blanc. “It’s like you’re mowing a lawn in a lime orchard,” exclaimed Aspiring Wino Jeff Colden. I also noticed a little b.o. funk in there as it warmed and opened, adding interest. It’s a very fresh and bright and juicy wine, but it’s a bit of a grass and grapefruit bomb for my taste. You won’t catch me spending $20 on a bottle any time soon, but if you like grassy New Zealand Sauvignon Blancs, this wine won’t disappoint. 2017 Desert Wind “Heritage Series” Chardonnay: Desert Wind purchased a vineyard parcel on a south-facing hillside of Washington’s famous Wahluke Slope in the 1990s, and I guess the 1990s means “heritage” nowadays? Yikes. In any case, this wine kept me in suspense. It started very creamy, and it felt at first like it was totally unbalanced. But then, just before all was lost, some focused acids and a perk of white pepper kicked in, followed by a touch of tannin on the finish, drying the tongue. Would I buy it for $28? I just might. 2017 Bodega Bouza Albariño: An Albariño from Uruguay! Now we’re talking. 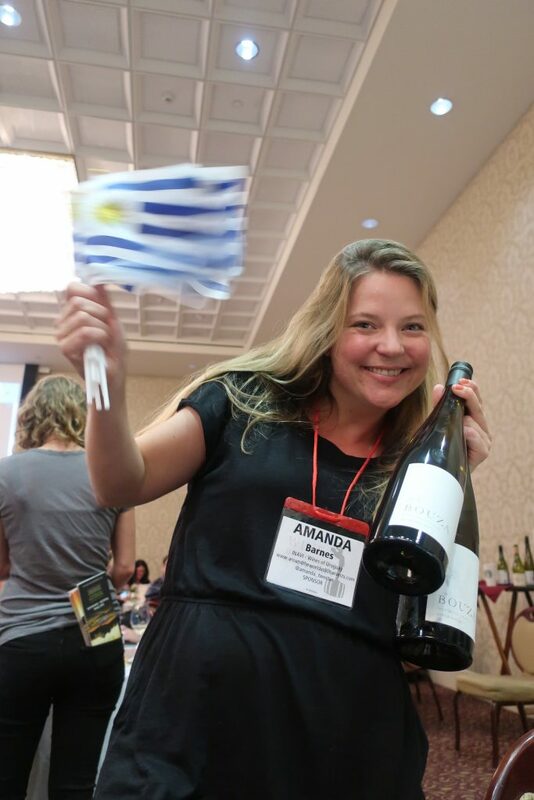 “I think this is one of the whites with the best potential in Uruguay,” the presenter said as she poured. The family of the winery’s owner was from Galicia in Spain, the original home of Albariño. They brought back cuttings and planted them in Uruguay 18 years ago. The wine had dry herbs on nose, with straw and something surprisingly dark underneath. A very appealing and unusual aroma! But when you drink it, it’s bright, with broad granny smith apple acids, some serious freshness, and a delightful mineral note on the finish. An excellent value at $20! 2017 Hard Roe to Hoe Dry Riesling: Who would have guessed that the innocent-looking rowboat depicted on the label of this wine was a Lake Chelan shuttle service from Lucerne to a brothel? The winery tasting room has a bordello theme, “so keep in mind, it’s not kid friendly,” we were warned. I quite liked the unexpected note of butterscotch in this Washington Riesling’s aroma, with some freshness giving it a lift. It tasted of ripe appley fruit, balanced with lots of sharp, focused spice and prickly acids. If you think all Riesling is sweet, try this one — there is nothing sweet about it, except perhaps for a whisper of a butterscotch deep in the finish. I wouldn’t hesitate to buy a bottle for $19. 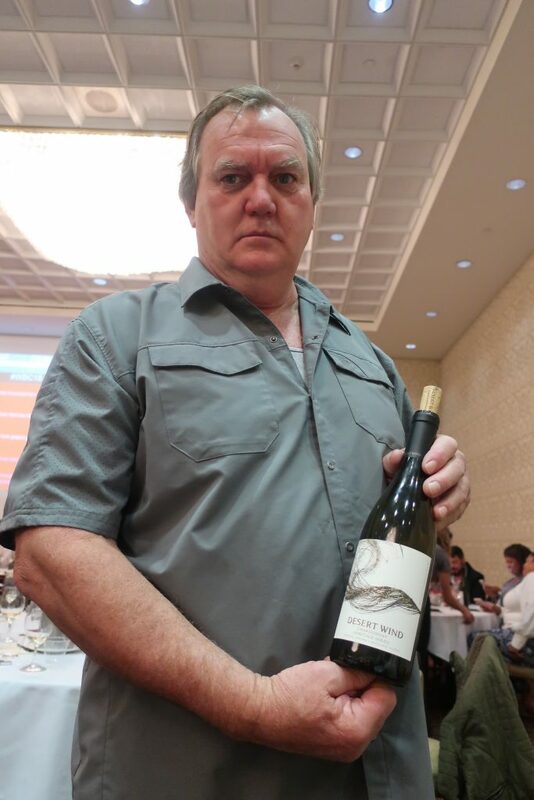 2016 Rodney Strong Vineyards Chalk Hill Chardonnay: This California Chardonnay comes from Chalk Hill, part of the larger Russian River Valley AVA (Chalk Hill has volcanic ash soils distinct from rest of the AVA). It moved from lush fruit — creamy pear and peach — to ample spice and a lift of freshness. And did I mention oak? OAK. There’s a bunch of it. That won’t please everyone, but since the wine ends spicy and fresh, it felt balanced, and I quite enjoyed it. I would love to try it with food. The price tag of $22 seems about right. 2016 Cadaretta SBS: Oak-phobes should try this wine instead, aged entirely in stainless steel. A blend of 67% Sauvignon Blanc and 33% Semillon, it also has no malolactic fermentation, which means you also won’t find much creaminess. This wine is the only white this Washington winery makes, so it had better be good, right? And it was. It had a fresh, warmly spicy aroma, along with an ample citrus note. The wine was delicate and perfumed, with a grounding savory note and a lift of bright, focused acids at the end. Wow, it’s a real value at $23! I would have guessed it was some sort of Alsatian something or other. 2016 Frank Family Vineyards Carneros Chardonnay: Made from Napa’s Lewis Vineyard, this Chardonnay presented lots of fresh hay and straw in the aroma, along with some overripe apple. Big ripe apple flavors moved gracefully to acids to oak to white pepper spice, to some freshness and minerality on the ringing finish. It’s pricey at $38, but it’s still a real value. A great finish to Speed Blogging! For more Speed Blogging action, check out this post about the reds! People don’t have shorter attention spans nowadays, according to the Wine Blogger Conference‘s keynote speaker, Lewis Perdue. They’re just more impatient. 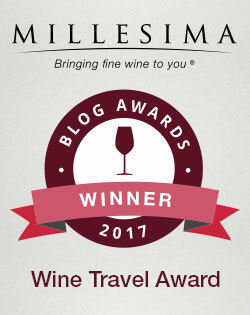 That’s good news for those of us who write overlong blog posts about wine minutiae. Ahem. 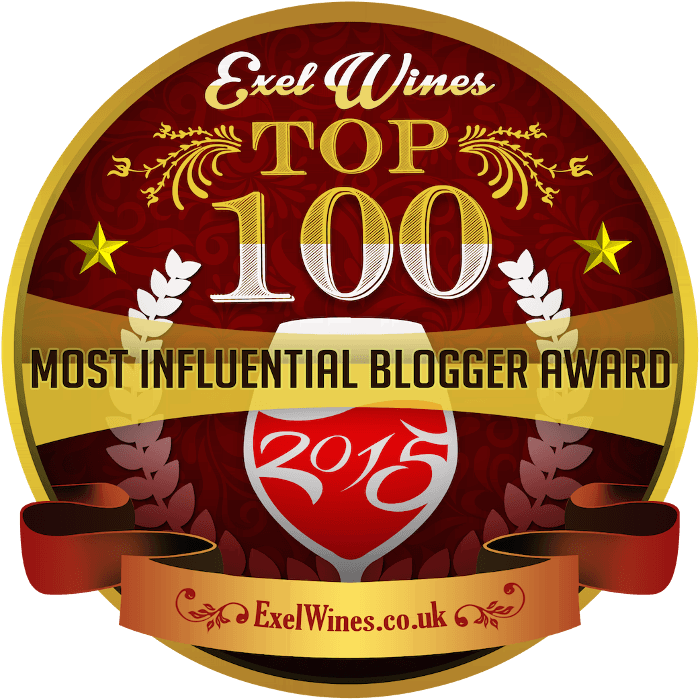 And it’s good news for my favorite event at the Wine Bloggers Conference: Speed Blogging. The conference organizers like to call it “speed dating for wine.” In case you’re too young to remember what speed dating was — does anyone still speed date? — speed dating involved spending a few minutes per person with several different potential matches. I can speak from experience when I say that “eight-minute dating” was about five minutes too long. Nevertheless, I met my husband at a speed dating event, so obviously the format has some merit. I also love Speed Blogging because, in this era of supposed shorter attention spans, it demands total focus for the hour of its duration. 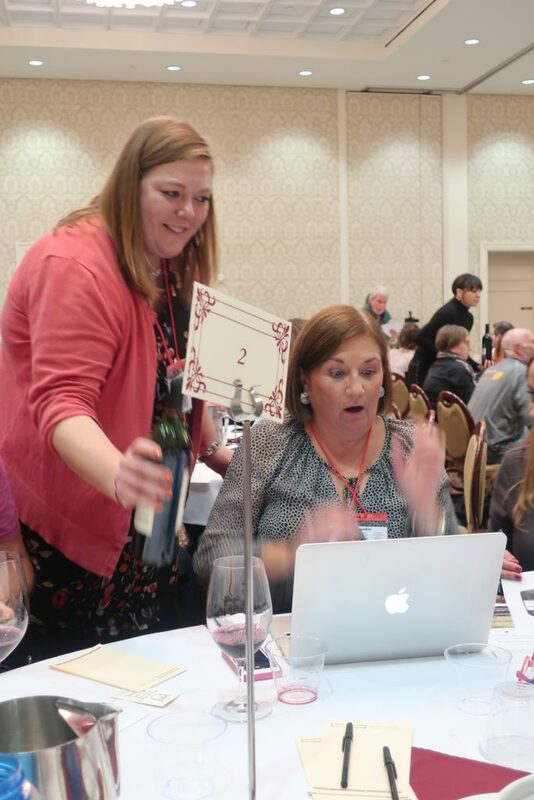 We bloggers, sitting at tables in a big ballroom, have only five minutes each with 12 different wine presenters. They’re trying to tell us about the wine, we’re shouting questions at them, they’re trying to give us carefully produced press kits, we’re tossing them on the floor because we don’t have time to read them… And, through it all, we’re trying to pay attention to the wine so that we can say something intelligent about it. It’s mass chaos, and it’s a joy. You might reasonably think that we have no business evaluating wines in such a setting. But it’s precisely because of the noise and the speed that Speed Blogging works. I focus intensely on my first impression of the wine, often more intensely than when I’m sitting in my silent living room with no distractions. It’s a challenge to assess wine in these circumstances, and like a vine under stress, the fruit of it can be richer and more concentrated. On to the reds, mostly from Washington, in the order in which they were presented! 2014 Woodward Canyon “Artist Series #23” Cabernet Sauvignon: The vineyard producing this Cabernet dates back to 1976, making it “old” by Washington State standards. Each label of the Artist Series wines, started in 1992, features a different Pacific Northwest artist’s work (rather like Mouton Rothschild). Composed of 92% Cabernet 6% Cabernet Franc and 2% Petit Verdot, this wine had a rich, dark fruit aroma with cassis and some vanilla. Very enticing! My mouth filled with fruit, followed by white pepper spice and supple mocha tannins. Oo, that’s a big boy, but with plenty of grace as well — not an easy balance to strike. It’s $59 at retail, and in this case, definitely worth it. “I kind of wish one of you had a steak in your pocket right now,” friend and fellow blogger Liz Barrett told Sager Small, the son of the winery’s owners and its viticulture and production assistant. Alas, he did not. 2015 Mullan Road Cellars Red Wine Blend: Founded by Dennis Cakebread, Washington-based Mullan Road is the “family’s first foray outside of California.” This blend of 49% Cabernet Sauvignon, 34% Merlot and 17% Cabernet Franc had a very appealing aroma of ripe dark cherry, with a bit of chocolate and a touch of green peppercorn spice. Another rich beauty, with full fruit, focused acids and well-integrated, big mocha tannins. Through it all, a shaft of white-pepper spice held everything together. I would pay the $45 retail price for this wine, no question. 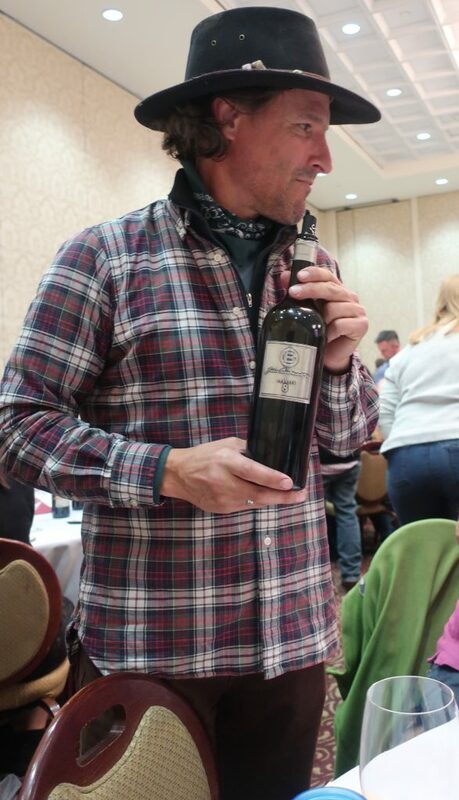 2014 Maryhill Winery Malbec: This wine wasn’t the only Washington Malbec that caught my attention at the conference. 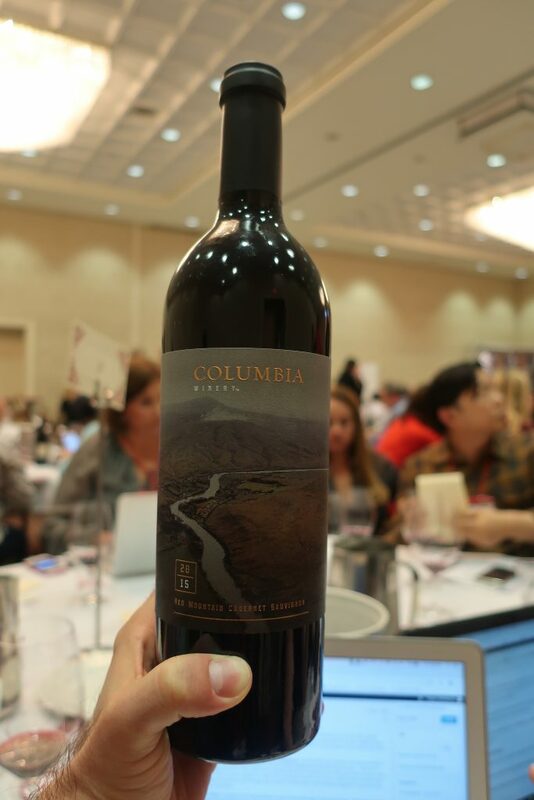 “We like to consider ourselves representative of the potential of the Columbia Valley; we work with 35 different varieties, and make 50 different wines,” according to Cassie Courtney, marketing director. That’s a lot of wines to keep track of, but certainly they didn’t give the Malbec short shrift. It had delightful fresh plum and prune fruit aromas. Flavors of deep, dark fruit were buoyed by a shaft of green peppercorn spice. Nice, even development, with focused acids and spice — what a deal at $26! 2015 Columbia Winery Red Mountain Cabernet Sauvignon: Columbia was the first to produce Syrah and Pinot Gris in Washington, but today, they poured their Cab. I liked its plummy aroma, with more of that deep, dark, ripe fruit so many Washington reds seem to have! It developed with grace on the palate, moving from fruit to focused acids and spice to tannins, which get bigger and bigger. The tannins get pretty darn serious by the end, so I would love to try this wine again in a few years. This wine is available only in the tasting room, “So come and see us in Woodinville.” Not at all a bad value at $38. 2015 Domaines Barons de Rothschild “Légend” Pauillac: “I’m in,” as my neighbor said when she saw this wine, and who could disagree? “A wine for every day” produced by the same winery that makes Lafite Rothschild, Légend is intended to make Bordeaux accessible to consumers. This blend of 70% Cabernet Sauvignon and 30% Merlot had a fresh plum aroma with some blueberries, and even a touch of cinnamon in the nose. It felt light on its feet, with bright, ripe cherries, some eucalyptus freshness and rather rough-and-ready tannins. They weren’t yet as well-integrated, or as graceful on the finish as I might have hoped for the $50 price. And though I realize that $50 is crazy cheap when compared to Lafite Rothschild, I’m not convinced that price is what most of us are looking to pay for an “every day” wine! 2015 J. Bookwalter “Chapter 8” Cabernet Sauvignon: This Washington wine comes from vines planted in 1988, which apparently counts as an “old” vineyard. Good Lord! Bookwalter restricts the yield for its Chapter 8 to about one bottle per vine, ensuring impressive concentration. Most vines yield two or three bottles of wine. It smelled of mocha and green peppercorn, and tasted of fresh plum with dark chocolate. I loved the wine’s confident, slow development from fruit to green peppercorn spice and mocha tannins. What a joy! Concentrated, yes, but with real freshness to balance. Sensational. If you can spend $100 on a bottle of wine, you’ll get your money’s worth with this one. 2015 J. Christopher Dundee Hills “Volcanique” Pinot Noir: Dr. Loosen is most famous for its fantastic Mosel Rieslings, but it also partners Chateau Ste. Michelle in Washington and Dundee Hills in Oregon. And anything the Doctor has his hands on is bound to be good. Clifford Robben, CFO for Dr. Loosen USA poured this Pinot, which had a bright cherry, cough syrup aroma, leavened with a bit of dust and vanilla. (That’s a very enticing aroma, if you’re in doubt.) It’s a cherrypalooza to start with, moving to white pepper spice and some soft, supple tannins on the finish, with no sag in the middle, as sometimes can happen with lighter-bodied wines. Great balance, and I would certainly pay the $30 price. 2013 G. Cuneo Ripasso Red Wine: I had a little trouble hearing owner and winemaker Gino Cuneo, but I believe he said he dries the grapes for three and a half months on mats, before crushing them. Ah yes, he’s pouring a Walla Walla ripasso, similar in style to an Amarone! I am IN. This blend of Barbera, Sangiovese and Nebbiolo was quite a transparent ruby-red, and wow, it’s nimble, with big cherry fruit, bright and juicy sour-cherry acids, and supple tannins. It’s lighter and less raisiny than I would have expected, but nevertheless, it’s beautiful. A very good deal at $45 a bottle. 2016 Artesana Tannat Merlot Zinfandel: This winery is a project of three girlfriends, according to the presenter, who is foolishly trying to present two wines. In speed blogging, that immediately makes me hate you. This blend incorporates the first and only Zinfandel produced in Uruguay. It has a heady, dark red-fruit aroma, and it’s really lovely, but the chatter about the other wine is driving me crazy. It’s a full, ripe, tannic blend, with sparkling spice and acids keeping it balanced. I rather love it, especially at the $20 price — that’s a great deal. They should have just focused on this wine, since it’s so good. I’ve had mixed experiences with Uruguayan wines in the past, but if this bottling is any indication, they’re making some delicious stuff down there these days. Someone recently asked me if I could drink wine made from only one grape variety for the rest of my life, what would it be? My first instinct was Chardonnay. It can be everything from steel-spined Chablis to rich California butterballs, and — no less important — some of the best Champagne. But those over-oaked, over-extracted California butterballs ruined Chardonnay for a generation of wine drinkers, and many people, quite understandably, avoid the grape entirely (try Googling “Anything But Chardonnay”). 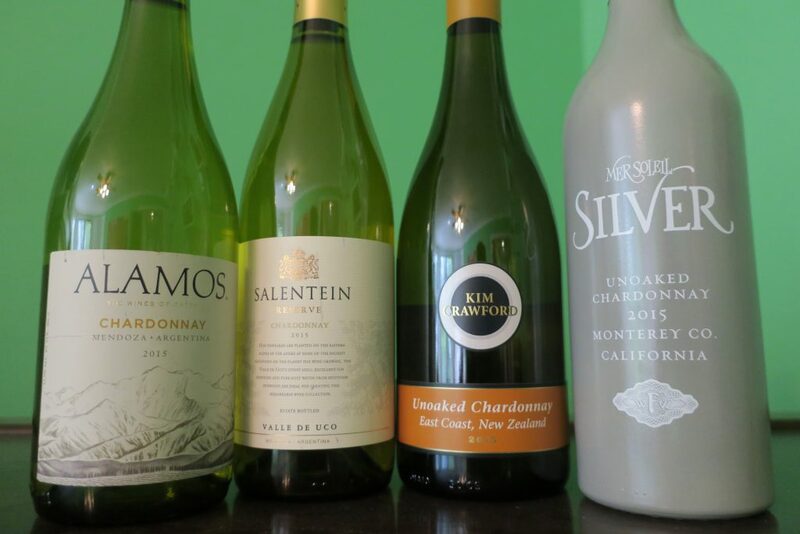 Even those who like Chardonnay often have misconceptions about the grape, as evidenced by a recent blind tasting I held, in which a Master of Wine took a sip of a New Zealand Chardonnay and exclaimed, “France!” I did no better than she, even though I had purchased the wines. 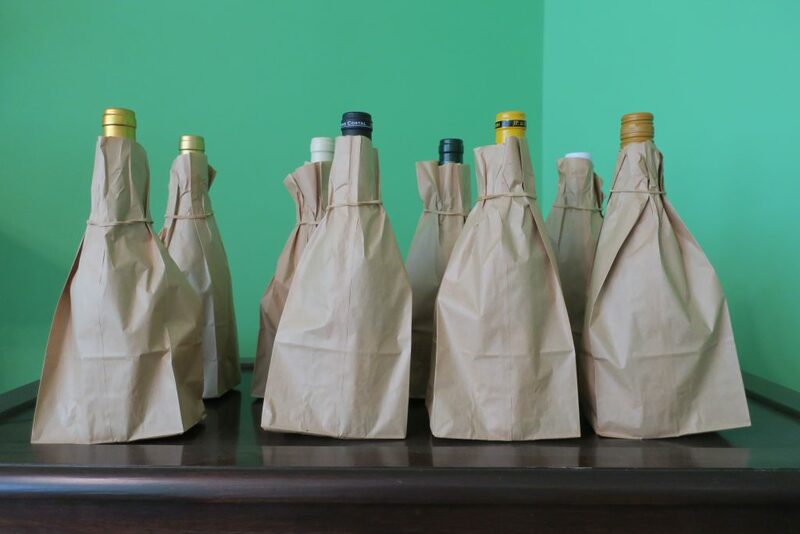 Blind tastings are a wonderful way to keep one’s ego in check. A bottle of Chablis inspired the blind tasting. I had agreed to sample a 2015 William Fèvre “Champs Royaux” Chablis, because how could I resist a free bottle of one of my favorite wines? The marketer who sent it wanted me to evaluate it as an example of the vintage. I decided the best way to do that was to compare it to some other 2015 Chablis. But then, why not also compare it to some Chardonnays from elsewhere in the world, in a modified Judgment of Paris tasting? I assembled seven other 2015 wines ranging in price from $8.50 to $57, produced in Chablis (France), New Zealand, Argentina and California. 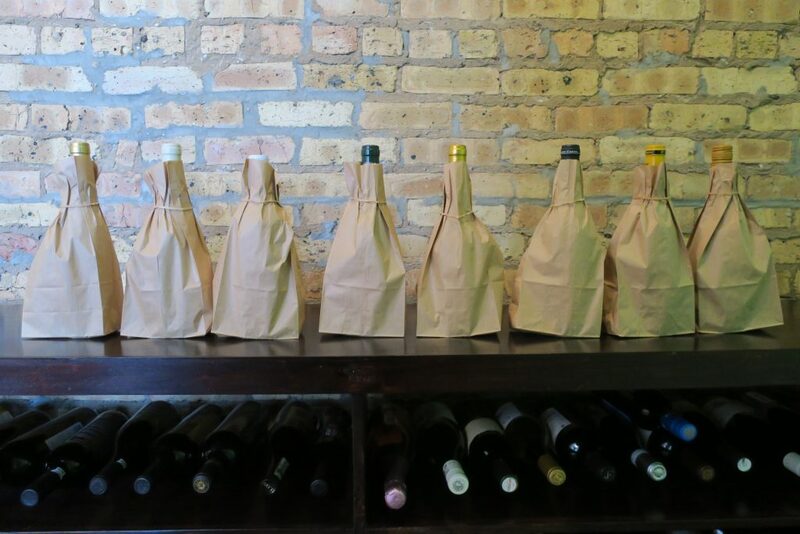 In order for me to also participate in the blind tasting, I bagged the bottles, mixed up the bags and numbered them. My husband then presented the wines to the group, so that I wouldn’t be able to cheat by looking at their necks. The results were absolutely fascinating. The $57 wine was rather unpopular, and the $8.50 wine tasted better than expected. There was broad consensus in our group of nine tasters about the best and the worst of the bunch, but not such broad consensus regarding the grape variety we were tasting. A few people guessed that we were sipping Chardonnay, but just as many thought the wines were Sauvignon Blanc, and another guessed Viognier. Chardonnay can take many forms! This wine proved immensely popular, garnering seven Loves and two Likes on my rating scale of Love, Like, Meh and Dislike. All but one of us guessed correctly that it came from France, an indication of France’s enduring reputation for quality. People praised its creamy mouthfeel and long finish, as well as its zesty and sharply focused acids. No one thought that it cost less than $18 a bottle, and two of us (including me) guessed that it cost $57. In fact, it was the sample bottle I’d received, the 2015 William Fèvre “Champs Royaux” from Chablis! It costs just $18 at Binny’s, where I purchased the other wines for the tasting. At that price, it’s a screaming steal. It was the hit of the tasting. Wine #2 was less popular. One taster asked, “Why does this taste cheaper to me?” I noted that it smelled richer than #1 but that it didn’t taste as complex. It felt hotter, more alcoholic, and rougher around the edges. Others liked its lightly buttery quality, and only two tasters rated it as low as Meh. One gave it a Love, and everyone else rated it as Like. Guesses as to its origin ranged across the map, though three people correctly labeled it as an Argentinian wine. A couple of people thought it cost $22 a bottle, but most wrote down the actual price. In fact, it was the 2015 Salentein Reserve Chardonnay from Argentina’s Uco Valley, a high-quality region just to the south of Mendoza. It cost me $15 a bottle, and judging by its reception, it seems fairly priced. Our third bottle fared worse, earning only two Likes and a bunch of Mehs. I liked its creamy and citrusy aroma and bright acids, but another taster remarked, “It’s acid that I don’t love.” Another commented that it was “oak city,” and a third complained that its “finish is like a teenage boy” (i.e. too fast). Others approved of its white pepper spice, however. As to its origin, the guesses divided among Argentina and New Zealand, and most people thought it cost between $16 and $18. In fact, it was the 2015 Domaine Costal Premier Cru Vaillons Chablis, which cost me $32.29 at Binny’s. Yikes! 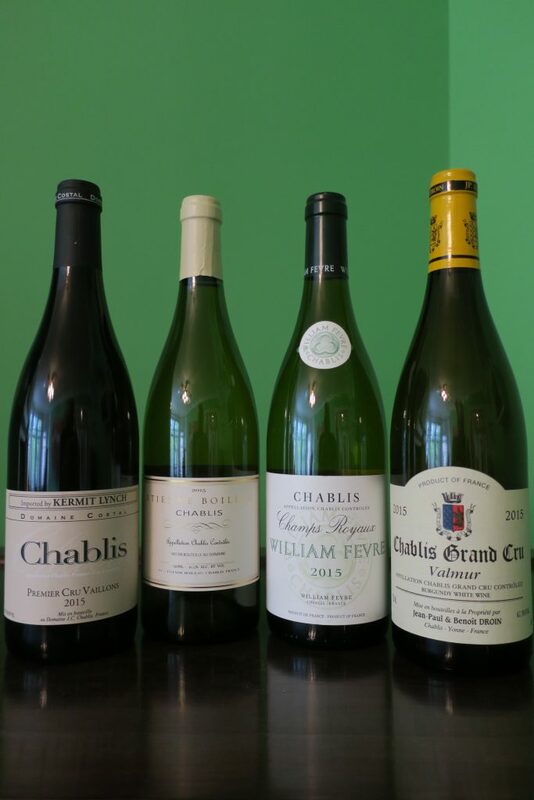 A Premier Cru Chablis comes from one of the region’s best vineyard sites, and it should in theory be better than a standard Chablis. I think this one might need a little more time in the bottle to settle down. People enjoyed this wine much more, with only one person giving it a Meh — everyone else gave it a solid Like. And again, almost everyone assumed it was French. “It’s more expensive and it’s France for sure,” one taster asserted. Only one of us guessed its true country of origin. I certainly liked it, with its citrusy and mineral aroma, bright lemon-orange acids and finish of focused spice. Almost everyone thought it cost $22. In fact, it was the 2015 Kim Crawford Unoaked Chardonnay from New Zealand’s East Coast, which cost just $16. If you prefer your wines bright, fruity and juicy, this Chardonnay is ideal for you. And considering that most people thought it cost $6 or more than its actual price, it’s a fine value as well. This wine divided the group more than any other. Reactions ranged from “Dislike from me” to “It was OK” to “I like it!” One taster complained that it was something of an oak bomb, but I found it more balanced. I was one of the three people in the room who actually liked this wine for its creamy/buttery start and cleansing shaft of sharp spice. I wrote “Rich and zesty, but disjointed.” It earned three Love ratings, two Likes, three Mehs and one Dislike, and people priced it anywhere between $15 and $57, with most clustered around $18. Almost everyone thought it came from California or Argentina. Tellingly, the only people who correctly guessed its true country of origin, France, were two of the people who enjoyed it the most. In fact, it was the wine that should have been the star of the tasting, the 2015 Jean-Paul & Benoît Droin Grand Cru Valmur Chablis (Valmur is one of Chablis’ Grand Cru vineyards). It cost a healthy $57. The problem with this wine, I suspect, is that we drank it far too young. Its components hadn’t yet integrated, and so the oak stuck out like a sore thumb. Give this wine five years in the bottle, and I have no doubt that it will be gorgeous. Wine #6 was a great big Meh. Only one person rated it as Like. Everyone else rated it as Meh, aside from two Dislikes. I wrote that it was pointy — “maybe too pointy” — and others noted its spicy aroma and general roughness. Even so, people generally guessed that it cost around $15. Only two people guessed its true price. In fact, this was the 2015 Alamos Chardonnay by Catena from Mendoza, which cost just $8.50. Four people guessed that it came from Argentina, which means either that they’re very good at blind tastings, or that they assume that a cheap-tasting wine is an Argentine wine (only one person guessed France). I quite liked the balance on this wine, and others complimented it as well, saying, “I don’t want to spit this one out,” and “It’s crisp and well-structured.” Our Master of Wine in the group remarked on its lemony character, exclaiming, “It’s like lemon meringue pie!” But others complained of a “funk aroma” redolent of “dirty feet.” This wine earned one Dislike, one Meh, three Likes and three Loves, making it the second-most popular wine of the tasting, after the William Fevre “Champs Royeaux.” People thought it was expensive, too. One taster thought it cost $18 and another $22, but the rest thought it cost either $32 or $57, and came either from France or (to a lesser extent) the USA. In fact, this was the 2015 Etienne Boileau Chablis, theoretically a step down in terms of quality from the Premier Cru and two steps down from the Grand Cru. It cost me $19, which is quite a bargain, considering that most of the group thought it cost much more. And then we came to the real disaster of the tasting, Wine #8. Only one person liked it. The entire rest of the group rated it as Dislike. As people tasted it, I heard things like, “Oh God, it’s horrible,” and “It smells like Mott’s apple juice in a box.” There was a touch of pétillance, which was surely unintentional, and an odd olive brininess. No one thought it came from France — most people assumed it was from Argentina or the U.S., aside from a couple of New Zealand guesses. In fact, this was the 2015 Mer Soleil “Silver” Unoaked Chardonnay from Monterey in California, and it cost $18. Most people assumed it cost $8.50, but I wouldn’t pay even that for this wine. Ugh. Interestingly, Binny’s no longer seems to carry this wine. If this tasting is any indication, the notion that French wines are quality and Argentine wines are not persists unabated. When people liked a wine, they almost always guessed it came from France. Few of us guessed that a high-quality Chardonnay could come from New Zealand. The versatility of Chardonnay is also still a surprise, as evidenced by the number of people guessing that we tasted Sauvignon Blancs. And we learned that whites aren’t necessarily at their best right out of the gate. Some of them, such as the Grand Cru Chablis, clearly need more time in the bottle to settle down. Others, such as the William Fèvre “Champs Royeaux,” are drinking beautifully right now. That wine is relatively easy to find — I’ve seen it on a number of restaurant wine lists — and it’s an incredible value for the money. 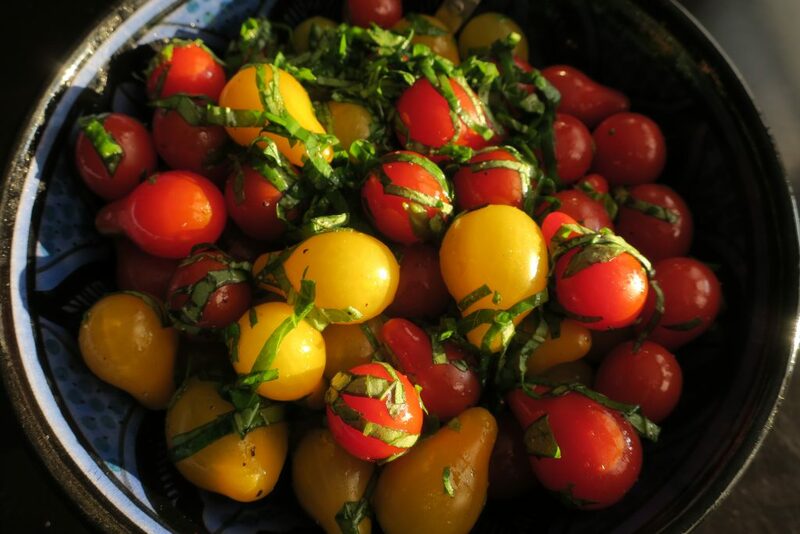 Seek it out, along with the delicious Kim Crawford Chardonnay from New Zealand. You can read a another post about the delights of Chablis here.